LG's new Android smartphones all feature big screens and multi-core chipsets. 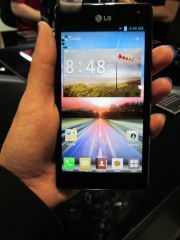 LG today unveiled the Optimus 4X HD, the company’s first quad-core phone, a slimmer Optimus 3D Max, and a 5-inch "phablet," the LG Vu--all at an event keyed to Mobile World Congress in Barcelona, Spain. We got to use themm and here are our early impressions of each. 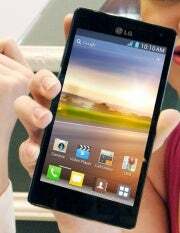 The LG Optimus 4X HD is LG’s first foray into the quad-core world. The 4X HD is powered by an NVIDIA Tegra 3 processor, but that’s not its only highlight. It also has a 4.7-inch display with a 1280-pixel -by-720-pixel resolution. And yes, that display is gorgeous. And yes, it’s fast. The Optimus 4X is super thin at 0.35 of an inch, but it isn’t going to win any awards in the beauty department. It pretty much looks like your standard LG Optimus phone with its black and gray color scheme. The phone feels durable and of high quality, however. Back to that quad-core processor. NVIDIA’s Tegra 3 (now referred to as the 4-PLUS-1 quad-core processor) has a smaller fifth core to help phones conserve battery life. The fifth core handles less demanding tasks such as active standby and music playback. I couldn’t test the battery in my brief hands-on demo, but performance seemed speedy and video playback looked gorgeous on that display. The 4X HD’s display is a True HD IPS display. Blacks look very deep while colors look vivid without being oversaturated. The Optimus 4X HD runs the Android Ice Cream Sandwich operating system and has an 8-megapixel backside illuminated sensor. I took a few shots in LG’s elbow-room only booth and was impressed with how the photos looked. The 4X HD is one of many quad-core phones to be announced at Mobile World Congress. We can’t wait to put these phones to the test. Last year, LG announced the Optimus 3D with a glasses-free 3D display. This year, LG reaffirms its love of 3D on mobile with the Optimus 3D Max. The Optimus 3D Max is fairly similar to the original Optimus 3D except that it has a slightly larger display (4.3 inches, 960 pixels by 540 pixels). It also has near field communication (NFC) support as well as a 5-megapixel camera. The Optimus 3D Max ships with Android 2.3 but will be upgradable to Ice Cream Sandwich. Another neat feature is that you can convert Google Earth, Google Maps, and other road views to 3D through the LG smartphone's 3D Converter. Want your 2D game to look 3D? The 3D Game Converter will turn any Android game into a 3D game (though it doesn’t always look so great). There’s also a built-in 3D video editor so you can make the 3D movies you shoot with the Optimus 3D’s 5-megapxiel dual lens camera look awesome. 3D on mobile hasn’t really caught on in the United States with the LG Thrill (the AT&T version of the Optimus 3D) and the HTC EVO 3D on Sprint being the only phones with this technology. I’m not completely convinced about the usefulness of 3D, but it is kind of fun to be able to play 3D games and shoot 3D video. The 3D quality on the Optimus 3D Max isn’t the in-your-face 3D of the movie theaters, but it definitely pops. It looks a little on the grainy side, but colors looked really good in my short hands-on demo. The 5.3-inch Samsung Galaxy Note isn’t the only “phablet” (or tablet/phone hybrid) out there. The Optimus Vu display is slightly smaller than the Note at 5 inches (1024 by 768 pixels) with the 4:3 aspect ratio and with the same resolution of the iPad’s 9.7-inch screen. In its press conference at Mobile World Congress Sunday, LG made a big deal about bringing LTE phones to the masses, the Vu included. In addition to 4G connectivity, the Vu will pack in a 1.5Ghz dual-core processor in a thin frame (0.33 of an inch), 1GB of RAM, an 8-megapixel camera at the back and 1.3-megapixel on the front. The Vu will launch running Android 2.3 Gingerbread but an update to Android 4.0 Ice Cream Sandwich is already in the works. The LG Optimus Vu has a built-in Notepad app that permanently stays on the bottom of your display so you can pull it up easily. The pen actually feels a lot differently than Samsung’s S Pen. It has a rubbery tip that absorbs the pressure you place on the Vu. I noticed a little delay when I tried to open certain apps with the Vu, but that may have been due to the fact that it was a demo unit that many people were using. The size feels somewhat awkward in hand, but any phone with a display of 5 inches or more usually does. 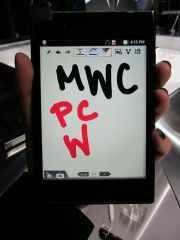 How it compare to the Galaxy Note? I’m fonder of the Galaxy Note’s pen software, but that’s simply because I’ve used it more.